The Forbes list of billionaires has just been released. At the top of the list is the Mexican financier, Carlos Slim Helu with a net worth of $53.5 billion, who slightly edged out Bill Gates with a net worth of $53 billion, and ahead of Warren Buffett at $47 billion. Fourth place is Mukesh Ambani at $29 billion, and fifth was Lakshmi Mittal, with a net worth of $28.7 billion. Charles Hollander has produced some of the most luxurious items for collectors. One of their top items is the 'Royal Diamond Chess Set', which is hand made with 9,900 black and white diamonds, in over 1168 grams of 14 carat white gold. It took 30 artisans over 4500 hours to make this exquisite masterpiece. If you have to ask how much, it is probably too expensive for you (you won't find the prices on the web site). However, we will let you in on the cost: $500,000. 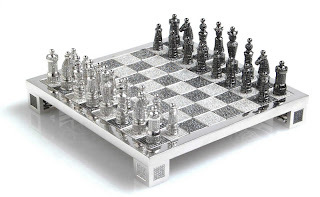 If the cost is out of your price range, then as an alternative, you can consider their latest product, the 'Gold Chess Set' with the king and queen set with diamonds. You can pick this up for a price of only $100,000. 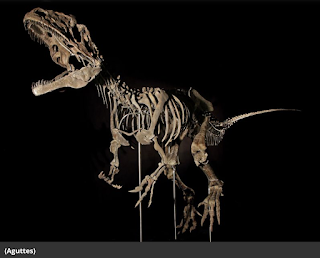 If you like bidding in auctions and you missed out on bidding on the lunch with Warren Buffett last week on eBay, you could have bought a 28.5 foot long dinosaur skeleton!!! This unique item was auctioned on the first floor of the Eiffel Tower by the French auction house Aguttes, and was hammered at $2.3 million. The seller was a British businessman and the buyer is an anonymous French art collector, who plans on lending it to a museum. It is believed to be a new species or new genus. The auction house said that the buyer may be able to name the specimen. The Most Expensive Bottle of Water Ever!